How can we pass pandoc_args to yaml header in rmarkdown? I'm using rmarkdown to produce a word (.docx) report. I would like to change the header of the toc. 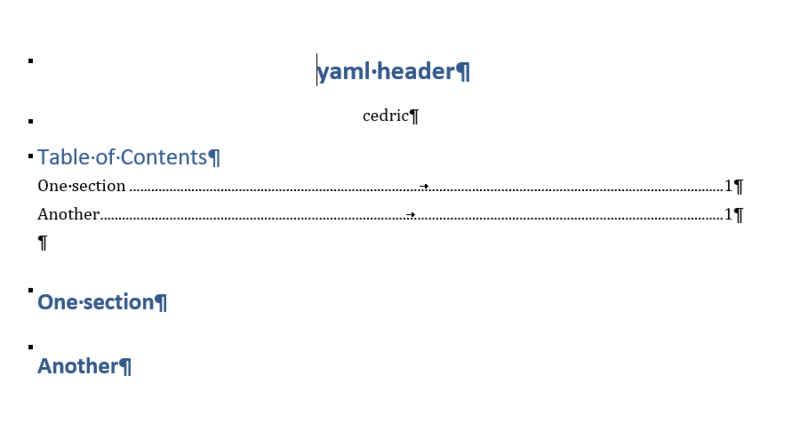 This seems possible as pandoc_args can be passed as options in the yaml header in the case of a doc file (1). But I'm not doing it right. Could anyone provide a working example ? The title of the table of contents is document metadata, so you can set it with YAML metadata block. Or passed it in with the -M command-line flag. Not the answer you're looking for? Browse other questions tagged r yaml knitr r-markdown pandoc or ask your own question.